It's pretty much all food this month because that's what I've been buying and because I'm always extra hungry this time of year. I think it's the change in seasons, the growing heat that increases my appetite. For instance, I just had dinner two hours ago and I'm ready to eat something a little more as soon as I post this. 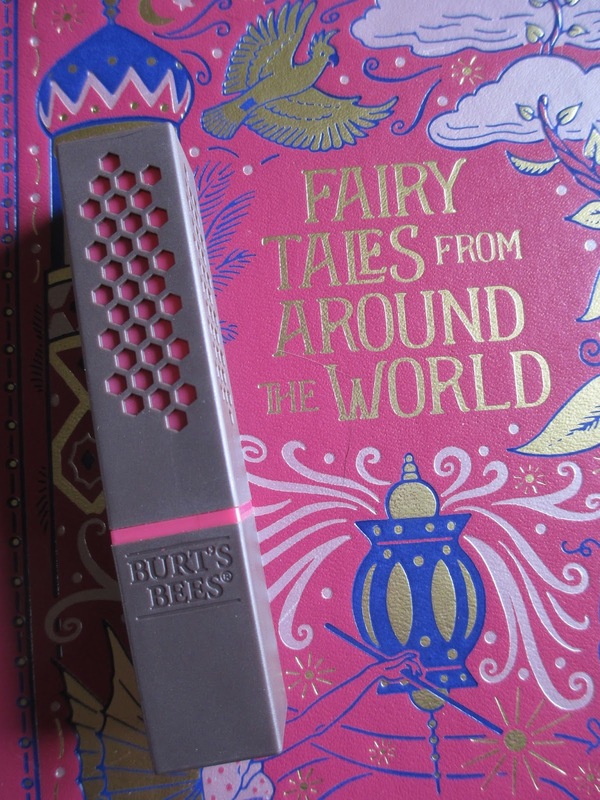 1) Burt's Bees Lipstick in 511 Magenta Rush - Burt's Bees makes great lip products. 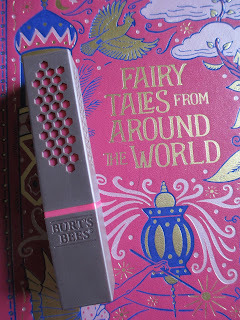 They're inexpensive (you know, compared with the other lip products I wear from Tarte, Bite Beauty, and Fresh) and on the more natural side, too. The Tinted Lip Balms are great for when you only want a hint of color, the Lip Shimmers for when you want just a tad more than a hint, and the Lip Crayons for when you want full color. (I haven't tried the Glosses or Shines.) The Lipsticks are new, designed to provide both color and moisturizing--which they most certainly do. The feel is similar to Revlon's Lip Butters that were really popular a few years ago. Soft and smooth, and they don't fade away awkwardly like some lipsticks tend to (they fade more naturally). Magenta Rush is a sort of hot pink color, just the kind I love, bright like a red lipstick but not as dark. 2) Floral & Herbal Ice Cubes - I used to make these with mint and then I just stopped. 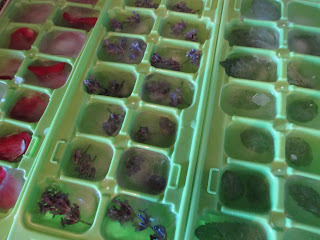 Use whatever you have around: mint leaves, rose petals, lavender, other flowers, maybe some herbs. Add water or iced tea or lemonade or whatever you like. Then you can put together pretty drinks, whether you're having tea or simply water. Great for just you or for get-togethers. 4) Jamaica (Hibiscus) - Usually I think of hibiscus as being the flower and jamaica as being the drink (pronounce the "j" like an "h"--this is Spanish, you know). So I'll just call it jamaica here. Jamaica has kind of an odd taste, bitterly tangy somehow and extremely distinctive. We used to make it unsweetened at home and I didn't particularly like it but I liked drinking it just because it tasted the way it did. There have been times since then that I've really been craving it and the sad thing is, you can't buy it everywhere. Don't buy it already made with sugar and artificial ingredients and carbonation; buy the dried flowers and brew it yourself, even if you add sugar. It's the most delightful, deep purple, greatest tasting drink ever. Refreshing, summery, unique, and addicting. If it tastes odd at first, just have it with lots of sugar and then start decreasing the amount of sweetener until you get used to it; it's worth adjusting to. 5) Hunan Black Tea - Remember how I've been looking for a good quality, loose, preferably bulk tea for sale around where I live? Well, I've seen this one--but I didn't know what Hunan meant, so I never bought it. Then I figured that it's black tea so it was at least worth trying a little. Turns out Hunan is just a region of China where this tea is grown (despite loving tea, I don't know much about it: variety depends on where a tea is grown, among other factors). This tea is rich and fragrant and almost sweet, very nice. It's organic (making it acceptable) but I don't think it said it was fair trade or anything like that (I'll have to look at the label again when I go buy more--they do sell it in bulk, which is why I have to wait until I'm back at the store to see the label). At 90 cents per ounce, it's pretty inexpensive, which is nice. So I've found my new morning tea. Whenever I want tea bags (like for when I travel--which isn't too often), I'll get Equal Exchange's Black Tea. 6) Diced Dried Papaya - At the same store where I got the tea, I sometimes buy these. This store is a local health food store (I can't remember if it has another location in the state or not), so they have quite a lot of bulk items--which is fantastic. These aren't bulk, exactly, but they are packed by the store. I first had them when I was in sixth grade and I just loved them: they are covered in sugar, after all. The fact that they're diced is also, I think, what makes them more appealing. 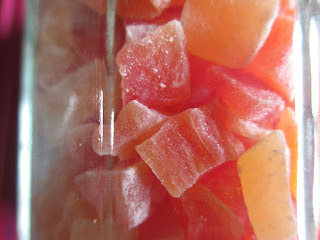 A great snacking item and a replacement for all those fruit gummies that are more like candy than fruit. 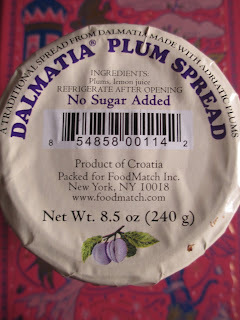 7) Dalmatia Plum Spread - I complain about how I can't have strawberry jelly or other sweet things in the morning (unless I've eaten something else first, like an egg), otherwise I feel sick. 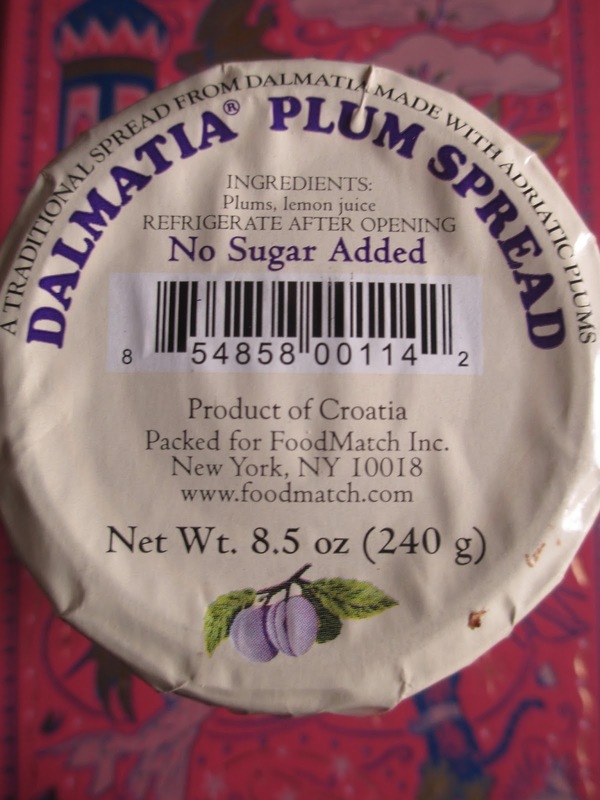 I happened to get this plum spread because I thought it looked cool. And now I love it. It's unsweetened; it's made with just plums and lemon juice. So it is a bit tart and can take a little getting used to (but tastes divine and elegant with butter). What's so great about it, to me, is that I can eat it in the morning with no problem. And that made me think that I need to take better care of myself. If I know I shouldn't be having sweet things in the morning, I should just leave the strawberry jelly to daytime only--and only have unsweetened jellies if I want something like that. This spread is imported from Croatia, so I probably shouldn't make it a staple (though I do want to buy it sometimes because I really like it). But I need to be looking for other products like this--my local farmer's market is about to start, too, so maybe I'll see what they have there this year. 8) Blue Milk - A couple weeks ago, I mentioned that I wanted to find a recipe for Star Wars Blue Milk that doesn't involve food coloring (the one with blue curacao does sound interesting, but I don't want to have to buy a whole bottle of hard alcohol to make a drink that I may or may not like). I finally caved/compromised by buying natural food coloring. And, you know what? The color is just right and I was very much amused, which was entirely the point. So, um, now I can make blue milk along with everyone else during the Star Wars days and when I'm going to watch the movies.